The mystery loss of Tasmanian tigers from mainland Australia was likely caused by climate change and not wild dogs or hunting by Aborigines, scientists said Thursday. The enigmatic animal—also known as the thylacine—was once widespread across the vast country, but was wiped out on the mainland around 3,000 years ago. They survived in the southern island state of Tasmania until 1936 when the last known one died in captivity at Hobart Zoo after the species was hunted to extinction in the wild. One previous theory on why the marsupials vanished from the mainland blamed the introduction by seafarers of wild dogs known as dingoes around 3,500 years ago. Dingoes have never lived in Tasmania. Another suggested hunting by Aborigines pressured the population of the dog-like animal with stripes on its back, which remains one of Australia's most mythical creatures—with some believing they still survive today. But a study published in the Journal of Biogeography this week, based on ancient DNA extracted from fossil bones and museum specimens, has now concluded their mainland extinction was likely triggered by drought. Researchers from the University of Adelaide's Australian Centre for Ancient DNA (ACAD) created the largest dataset of thylacine DNA to date with 51 new genome sequences and used it to track population sizes through time. "The ancient DNA tells us that the mainland extinction was rapid, and not the result of intrinsic factors such as inbreeding or loss of genetic diversity," said lead author Lauren White. 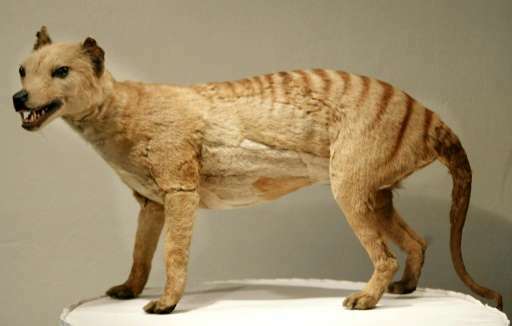 A large and genetically diverse thylacine population lived in parts of southern Australia until three millennia ago, when more drought-prone seasons caused by the onset of the El Nino weather system likely wiped them out, the scientists found. "We also found evidence of a population crash, reducing numbers and genetic diversity of thylacines, in Tasmania around the same time," said ACAD deputy director Jeremy Austin. "Tasmania would have been somewhat shielded from the warmer, drier climate because of its higher rainfall, but it appears that this population was also affected by the El Nino event before starting to recover." El Nino is a climate phenomenon that occurs every few years. Its most direct impacts are droughts in normally damp places in the western Pacific, such as parts of Australia, while drier places tend to suffer floods. Tasmanian tiger sightings are still regularly reported and logged on websites devoted to the animal but conclusive proof of their existence has never been produced. 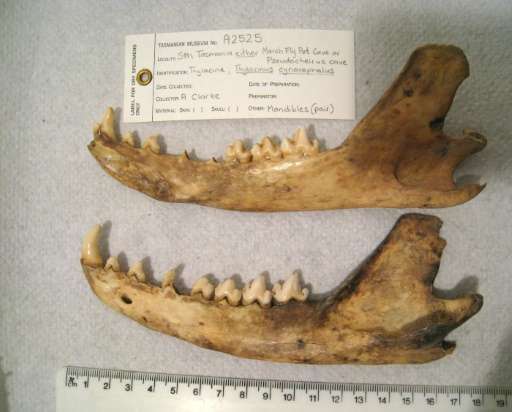 Bigger and brainier: did dingoes kill thylacines?